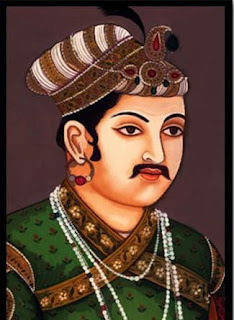 Akbar was a great emperor of Mogul dynasty in India.He ruled India during 1560 to 1605.He himself was an illiterate, but he invited several scholars in his court.Among these, the following nine were very famous and they were called nine jewels of his court . Tansen was a great singer. 2. राजा टोडरमल एक वित्तीय जादूगर थे | King Todarmal was a financial wizard. Abul Fazal was a great historian . King Maan Singh was a great man who was known for his chivalry. Beerbal was a great witty , wise (intelligent ),poet, and writer who was known for his valuable Advice. Dasvant was a great painter. Abdus-Samad was a brilliant calligrapher and designer of imperial coins. Faizi was a great poet. Mir Fareh-ullah Shirazi was a financier,philosopher,Physician & astronomer.